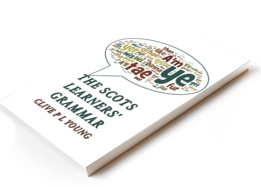 You really know you are a Scots speaker when you start saying these spontaneously. Oh and don’t forget real Scots shout Heech!, Hooch! or Heuch! whenever dancing to a reel. These are important wee words and short phrases dropped into speech to establish a rapport between the speakers and generally keep the conversation going. Ye ken, och weel, A’m seein him the morn onieweys, like. Like (in a final position as in the example) is also a common marker in some dialects but thought of as ‘colloquial’.